It’s hard to find a reliable tool that can be used in any project and in different materials that would require variety of cuts and dimensions. While there are several available in the market, finding for the best kind is what makes it tricky and hard to do. You have to check each one carefully to know which has the best feature that will fit to your needs and at the same time has the most positive feedbacks from the customers who have used it. We buy a router for several reasons whether it is for a professional job or for a handy power tool to be used at home for fixing our furniture, doors, cabinets and others. I bought one to mount on my home-made router table at home where I usually do my DIY wood projects. Because I would need one to fit to all possible tasks I’ll be working on, I decided on a variable speed router because of its versatility and flexibility of use. 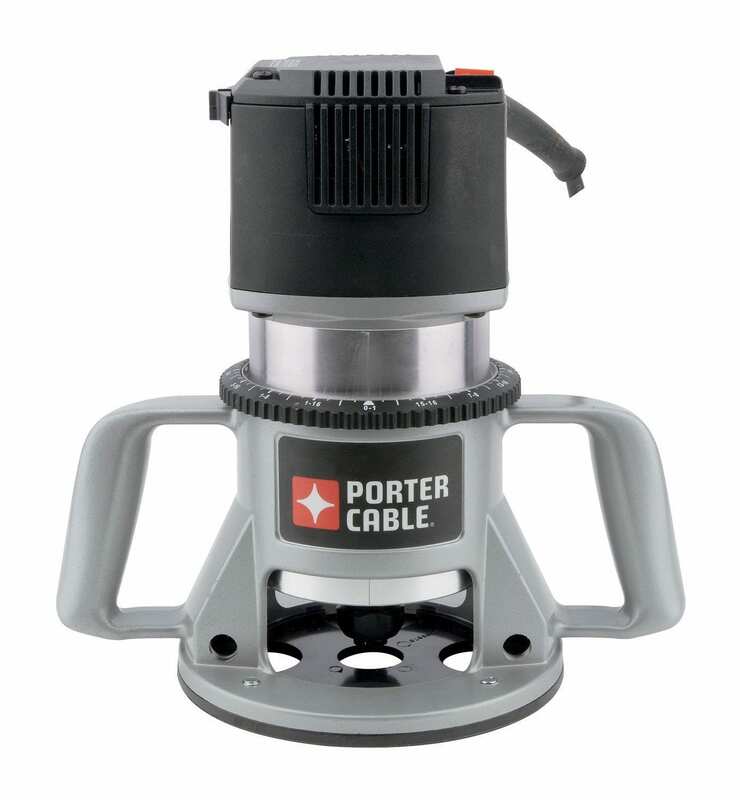 After going through reviews and reading through feedbacks, I chose to buy this PORTER-CABLE 7518 Speedmatic 15 Amp 3-1/4 HP Fixed Base 5-Speed Router, which I’m very glad I did. The power is superb and it gave me the variety of cuts I needed for my projects and allowed me to use it to any material which definitely works for me. The versatility and powerful performance and capability of this speed router make it a reliable tool in both professional and home-use setting. With high power motor and five-variable speed feature, it allows users to make different dimensions of cuts, material and be used to any projects from simplest to even the toughest jobs. It is with the same reason that it can be a useful tool at home as with only one power tool, it can already do several applications. And with its other features make it user friendly that even non-professionals can handle the job. In choosing for a router, you can either choose a single speed or variable speed depending on what suit your needs for the project you are working on. Though each has its own strengths and limitations, choosing a variable speed router has these following benefits. One main benefit of using a variable router is its ability to adjust the speed base on your application. And without that limitation, it will allow you to make different sizes and dimensions of cuts. It gives you a wider scope in terms of both router performance and outputs. This makes the router useful to any kind of tasks that may require variety of wood cuts. And because of this, you will be able to make a more accurate and precise cuts for your project. Having the capability to provide you with different speed, means it is capable to be used to any kind of materials as well. Heavy and exotic woods may need a different power and speed than with the ones with lesser weight. Variable speed routers will allow you to do more kinds of wood work hence, increasing your productivity and outputs. If you are running a woodworking shop, this will be most beneficial for you as with just one router, you will be able to cover more and various tasks. PORTER-CABLE 7518 Speedmatic will allow you variety of wood applications, even on the toughest jobs with ease with its 15-amp motor power and its variable speed in five increments of 10,000, 13,000, 16,000, 19,000 and 21,000 RPM. It also comes with other added impressive features that will assure you of top notch performance, various cut dimensions, flexible components, ease of use and productive results. This speed router is built for various cut dimensions and wood applications in any material. The variable speed can be adjusted in five different levels hence you can set the router to whichever your work requires. With this, you will be able to make precise and correct cuts for a high quality result. Its 15-amp motor power makes it possible to use even use it on heavy duty materials. It is designed with a soft start feature to reduce torque and for smooth startup. This also prevents you from accidents during startup with the machine being aggressive upon switching it on. It has the auto-release collet system that allows easy bit removal after use, hence allowing you to save time and effort as well. It is built with a precision-machined aluminum motor housing and base that makes this power tool durable to any hard jobs and applications. It has a sealed-bearing design that keeps dust out of its core components for a longer tool life. It comes with integrated cast handles for stability during operation and safeguarding the machine from wear and tear over time. Before choosing the best product to buy, I find it very helpful to check and read through different feedbacks and reviews straight from its users who have already tried and tested it. They are the ones who could provide us with realistic view of the overall actual performance of any product, which in this case is the speed router. Overall, this product has pretty much garnered a high rank and positive reviews from its customers. They find the product easy to operate and most importantly it works great to any wood application that even professional carpenters and woodworkers swore to have been using it at work. It has high power and variable speed that is ideal even on heavy duty tasks. There are few things that some customers think would need to be ironed out though. More than one customer pointed out about the speed control slider switch, which is a bit loose and has short distance to the router on/off button hence he would unintentionally press it when switching the button on or off. It is ultra-sensitive to soft touch that since positioned also near the height adjustment, router would change speed accidentally when adjusting the height. It is a little heavy weight, too compared to others. Other than that, it is a good router as its performance and quality of outputs will not let you down. Aside from this power tool, there are also others available in the market that you may want to also consider. This Porter-Cable model router uses a 1-3/4 horsepower motor and generates 27,500 revolutions per minute for more precise cuts. It is a fixed base motor that will allow you to move the motor pack between plunge and d-handle bases. It is designed with a precision machined-aluminum motor housing and base for increased durability and efficiency. It is also has a dust-sealed switch ball-bearing construction that guard against wear and tear even on frequent and heavy duty use. There is an under-table stop that is specially designed to keep the motor in place. For added convenience, it is built with ergonomic molded grips for comfortable handling even on long time use. With a micro-fine depth adjustment ring for a more precise adjustment in 1/64-inch increments, this speed router is powered by 11-amp motor and 1 ¾ HP which is ideal to use even through the toughest wood. It is built with a dust-sealed switch that protect it from dust ingestion for longer switch life and a nickel-plated motor housing for smooth and long-lasting depth adjustment. And with the motor cam lock and quick-release motor latches, it makes adjustments and base changes fast and easy when you need to change tasks. For added ease in operating this router, a unique switch and cord set configuration is designed to allow you to keep the switch in either your right or left hand. With a powerful motor of 12-amp and a 2.25 horsepower, and an advanced speed control technology between 8000 – 25000 RPM, any broad range wood application will be possible and easy to do. The variable speed option will allow you to choose and adjust to whichever speed that will match to your wood piece and project. And with the built in Constant Response Circuity, this router will be able to maintain your adjusted speed consistently throughout the cut, hence give you precise results. Perfect for any woodworking projects, this router features a soft-startup, a motor power of 12-amo and a 2 ¼ horsepower that makes it handy even to heavy-duty applications. It offers reliable, smooth and variety of cuts with a variable speed of 10,000 – 23,000 RPM. It is designed with a dual-position switch that will allow you to cut power, yet still have the complete control of the router with both hands still on the rubber coated handles. It comes with a spindle-lock feature that makes bit changes easy and a durable cam lever for a quick depth adjustment and motor release. The package comes with the router motor, fixed base, i/4 and 1/2 – inch collet, collet wrench, carrying case and an operating manual. For any woodwork or project, be it for home or commissioned professionally, it is just as important to have the best power tool to use for the job. With the right tool, aside from getting the job done, it also saves you a lot of time, money and effort. The best variable speed router is one that is high in power and speed that will allow you flexibility and variety of cuts and at the same time manage to use it on different materials. With variable speed, it can be adjusted based on the application, thus you will get the correct and accurate sizes and cuts for your work. This is where PORTER-CABLE 7518 Speedmatic comes in. It is because of these reasons that it is why it can be considered as one of your best options. With its other added features, it makes it even more convenient to use and easy to operate.